Work has been pretty hectic this past week. Everything at OPP is winding down for the holidays, so it’s crunch time. OPP recently received a grant from Youth Service America to serve as a lead coordinator for Martin Luther King Day service events. The Public Ally at our site (Phil, who wrote the grant), and the VISTAs (Jacqui, JoJo, and I) are in charge of coordinating OPP’s service project and reporting on volunteer projects throughout the state. I’m super happy to be involved with MLK Day–as you may know, my favorite class at Holy Cross was 20th Century Social Movements with the fabulous Stephanie Yuhl–but we only found out that we won the grant about a week ago. MLK day is in a month. Do the math. Chaos ensues! So let me just say I was pumped when I came home to find the following three things: a basket full of cookies that my mom got from work, my Nook2Android card to hack my NookColor into a tablet, andddd…..MY HOLY CROSS YEARBOOK! My friend Tina was the editor of the yearbook, so naturally there are a million pictures of me and my friends within the Purple Patcher. The cover is gorgeous, the pictures are great (except for one extremely unflattering picture of me in a marching band uniform…but it’s super small so I won’t complain that much. )…Tina nailed it! I technically was on yearbook staff but I didn’t do nearly as much hard work as Tina did, so I have to give her mad props. This yearbook makes my high school yearbook look like an issue of the National Enquirer. I graduated high school in 2007 so the yearbook staff attempted to pull off a spy theme. I say attempted because the handprint on the cover makes my yearbook perpetually look like someone had dipped their hands into a bag of Lays before touching the yearbook. Plus, my friend’s name was spelled differently (none correctly) every time it appeared in the yearbook. 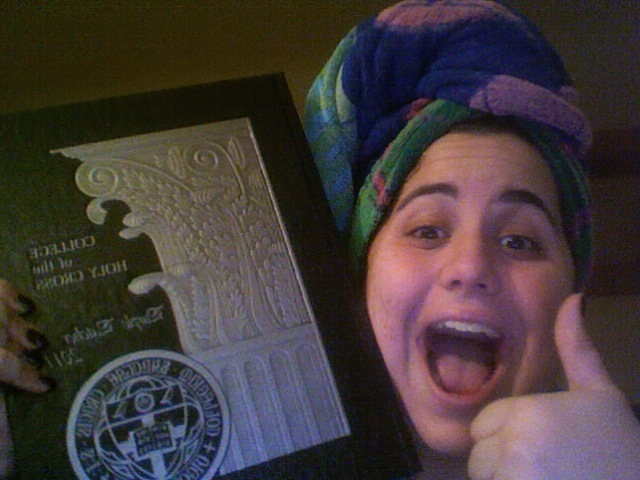 Yes, the Holy Cross Purple Patcher puts the Sheehan High yearbook to shame. Seriously. This was the perfect treat to come home to (well, besides the cookies). Alright ya’ll, I gotta go creep through the yearbook like I’ve been dying to do since we started to put it together.